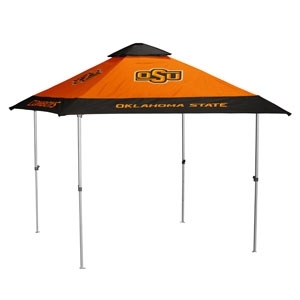 The Oklahoma Sooners Pagoda Canopy boasts the most deluxe features of pop-up tents. Solo-up technology allows a single person to easily and quickly setup the tent. The durable steel frame has 3 levels of height adjustment and a footprint small enough to fit in most parking spots (8 x 8 ft). It supports a canopy with suspended overhang valence giving 10 x 10 ft of coverage. The team design waterproof canopy is made of Ultraviolet Protection 50 material for protection from sun and rain.